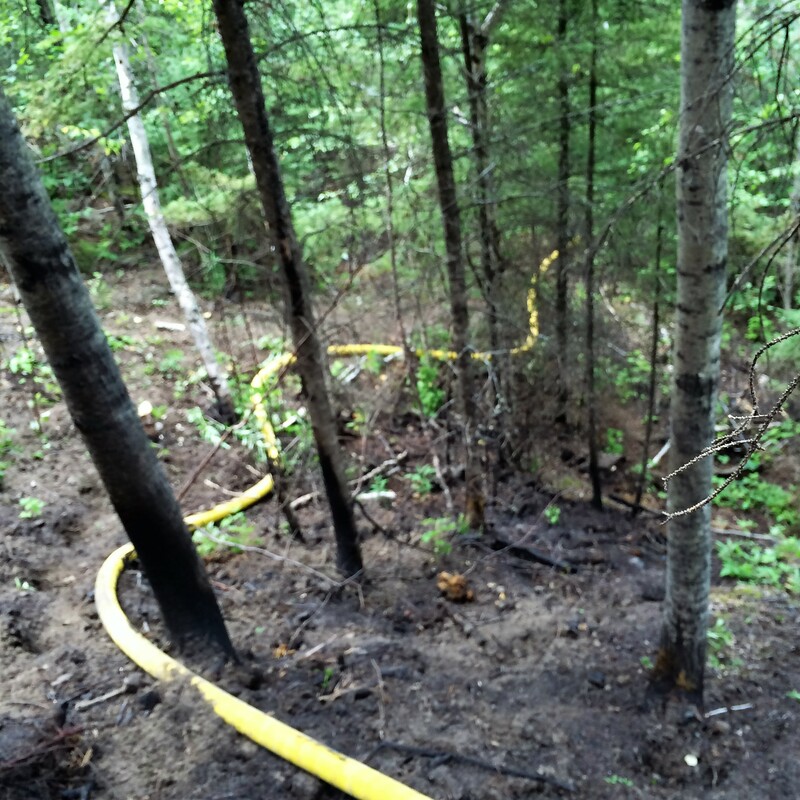 Safety Boss was asked to control a fire caused by smoldering bitumen on the hill side in the middle of a new forest. We had to ensure not to disturb the new growth or the stream which they had to cross. SBI deployed a seven (7) man crew and managed to spot the Smokey Fire Truck on a recreational quading trail approximately 5 km from Fort McMurray. The team proceeded to roll out approximately 250’ of fire hose through the newly grown forest being careful to follow paths and keep the hose from disturbing new growth. When they came to the stream that was approximately 50” across the crew put their rope training skills into play and built a rope system to carry the hoses and tools across the stream. The team was able to cross the stream further down on a couple of fallen logs. Once across there was another 100′ of hose laid out before they had to climb a 60 degree slope up for another 150’. Reaching the fire, the team started to dig out the area that was smoldering and soaked the area with water as they worked carefully not to let the run off from the hillside go directly into the stream. Our crew manually dug up an area approximately 10’ round and approx. 3.5’ deep. The temperatures were in the mid to high 20’s so they made sure to work shorter shifts to conserve everyone’s energy in the event this was going to be a long day. The crew chief was shown another hot spot in the area that required a track hoe digging down approximately 12’. Water and foam was applied to the area and allowed to soak in order to extinguish. The job was executed successfully and was a new experience for the team to undertake allowing them to apply their skills between rope rescue and fire applications. The client was impressed with how we got our equipment across the stream to preserve the environment as they took several pictures to show our team in action. Stay warm and enjoy your family day!